In 2013 the Dodge County Historical Society will celebrate the 75th anniversary of its founding. The local citizens who got together in 1938 to form this society did so in the depths of the Depression. They started the process of collecting artifacts, documents and information about our early pioneers. Their work continues to this day, and we all owe a debt of gratitude to these amateur historians who saved so much of our heritage. On February 11, 1938, the first meeting was held on the second floor of the Concert Hall on the south side of Front Street. They voted into office the first Board of Directors: Albert Arndorfer, Caroline Beule, Doctor R.R.Roberts, James Malone, Roy Butler, Joseph Hoyt, George B. Swan, Mary Spellman and Charles Starkweather. Officers were elected: President Joseph Hoyt, Vice-President Charles Starkweather, Secretary Albert Arndorfer and Treasurer Arthur Bedker. It was agreed dues for the society would be 50 cents per year. Two of the prime movers of this project were Mrs. Caroline Beule and Mr. Joseph Hoyt. For Caroline Beule, it was the realization of a dream. She had been tireless in her efforts to interest others in the project. She was born in 1856 of German immigrants and lived in Beaver Dam all of her life. At age 16, she worked in her father’s general merchandise store. After seven years, she married Peter Buele who was a partner in The Corner Drugstore with Dr. Babcock, Joe Hoyt’s grandfather. From1898 until 1912 she was a cashier at the Old German Bank. This active public-spirited woman continued all her life to educate herself and others. A charter member of the Women’s Club, she also served as District Chairman of Public Health. That group was responsible for hiring a city nurse and a Dodge County nurse. 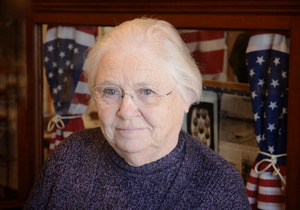 She was active in the American Legion, and with Sadie Davison, launched the idea of Dodge County Memorial Drive, the planting of 7 miles of trees to honor veterans of American wars. In 1913 after attending a PTA meeting in Chicago, she returned home, enlisted the help of the Women’s Club and the Superintendent of Schools and soon Beaver Dam had a PTA. The first Girl Scout Troop meeting was held in the Beule barn. Mrs. Beule donated $1,000 for the museum to be used as the board saw fit. The Hoyt family owned the Concert Hall. Joseph was the grandson of two pioneer doctors, Dr. Hoyt who founded the Empire Flour Mill and Dr. Babcock who bought the Concert Hall in 1847. This three-story brick building was, and remained for some time, the tallest building in town. Through the years, stores, offices, and even the City Council Chambers occupied the lower floors. The top floor was the theater. Joe’s brother Harlowe Hoyt, with Joe’s help, later wrote the definitive book about traveling theater in the 1800s. Town Hall Tonight was based on the incidents they witnessed growing up. The hall was also used for lectures, political rallies, dances and even roller-skating. The first local militia, The Burchard Guard, held their drills there. After this long history, it was only fitting that the museum should have its home there. Mr. Hoyt donated the use of two rooms on the second floor and provided heat and lights. He also served as custodian. An important first project was to compile lists of residents and former residents to seek information on people and events of the first 100 years with the possibility of publishing a book. Charles Starkweather took charge of the history. He interviewed many elderly local residents and sent letters to former residents. In the next few years, the stories poured in. They told of tragedies and hardships. There were fires and floods, crop failures and wars. But they also told of successes and triumphs over diversity. There were funny anecdotes of everyday life. Many of these letters were published in the newspaper. The history book they created is still used almost daily for research. At one time it was reported that 40 girls under the direction of 10 women were compiling all the data. Photographs and artifacts were sent from all over the country. The State Wide Museum Project in Milwaukee, a branch of the WPA, assisted in the setup and reconditioning of many of the items collected. Cases from the Milwaukee museum were donated and are still in use today. Soon the Dodge County Historical Society was a real asset to the community, open to the public from 2 until 5 on Monday, Wednesday and Saturday afternoons and Wednesday evenings from 7 to 9. Teachers began bringing their students and documents. That practice continues. Times were tough. Like the rest of the country, the city was going through a deep depression. The closing of several factories, Bear Brand, Western Malleable, Solar Battery and Beaver Garment Company, had contributed to unemployment. A record number of families were on relief. The newly built tourist camp in Swan Park was closed because hoboes were living there. The rise of Hitler and the unrest in Europe contributed to the unease, although no one knew that the horror of WWII was looming on the horizon. Still, everyday life went on. There were concerts in Swan City Park, swimming at Crystal Lake Beach, and fishing and boating on Beaver Dam Lake. Librarian Hattie Doolittle still held sway at Williams Free Library, collecting fines for overdue books with a disapproving frown while introducing a new generation of children to the wonderful world of books as she had done since the 1890s. The movies were even more exciting because hometown boy Fred MacMurray was a rising leading man. And Brian Donlevy, whose father had once managed one of the woolen mills, was likely to turn up in a character role. He was the kid who had been mascot of Company K and once ran away to join the troops. Motivation to create the historical society included preparation for Beaver Dam’s centennial celebration. Buoyed by national publicity and encouraged by the response of the residents, these children and grandchildren of pioneers faced the challenge to create a superb celebration for the 1941 centennial. A historical pageant with a cast of 800 locals was staged at the fair grounds. Two huge parades over two miles long were held on July 5th and July 6th. An old settlers picnic was held at Swan City Park. There were baseball games, an air show, and dances were held each night at the Armory. The Dodge County Historical Society museum is located in the former Williams Free Library at the corner of Front and Center in downtown Beaver Dam. Regular hours are 1-4 p.m. Wednesday through Saturday. In 2013, the museum will also be open from 10:00 until 1:00 on the last Saturday of each month for informal discussions on specific topics of local lore. Come join the discussion and view the exhibits. On Saturday January 19th at 1:00, Linda Firestone will display and share information about her collection of Monarch memorabilia. On Wednesday February 27, the society will sponsor a Fish Fry at the American Legion – a speaker for this event is to be announced.